The Vedute room of London’s Wallace Collection is a window on to the Venice of the aristocratic Grand Tour. Densely hung with picture-postcard views of the floating city by Canaletto, Guardi and Canaletto’s followers, the gallery “reflects the Franco-British taste of our founders”, the Hertford family, says Lelia Packer, the museum’s curator of Dutch, Italian, Spanish, German and pre-1600 paintings. Over time, however, the shimmering blues of the sky and lagoon in these pictures have been obscured by a “yellow film of dirty varnish”, Packer says. “That could be a single layer or multiple layers,” she adds, as varnish was traditionally applied to “saturate the colours”. A multi-phase conservation project called Venetian Views now aims to clean and analyse all 28 vedute paintings in the Wallace Collection, including their frames, by spring 2020. With no paintings conservator on site, the museum is sending the works in batches to the Hamilton Kerr Institute, part of the University of Cambridge’s Fitzwilliam Museum. Most had not been cleaned since they entered the Hertford collection in the 18th or 19th centuries. The Cambridge specialists are also using x-ray and infrared reflectography techniques to develop “a clear picture of how they were painted”, Packer says. This research could identify the hand in some of the anonymous works. So far, the Hamilton Kerr Institute has treated a pair of large Canalettos of the Bacino di San Marco, seven scenes by his followers and three Guardi capriccio paintings, which inventively reconfigure Venetian landmarks. The work was funded by the Bank of America Art Conservation Project, the Charles Hayward Foundation and individual donors. The Wallace Collection is turning to the public to support the next phase of the £250,000 project. 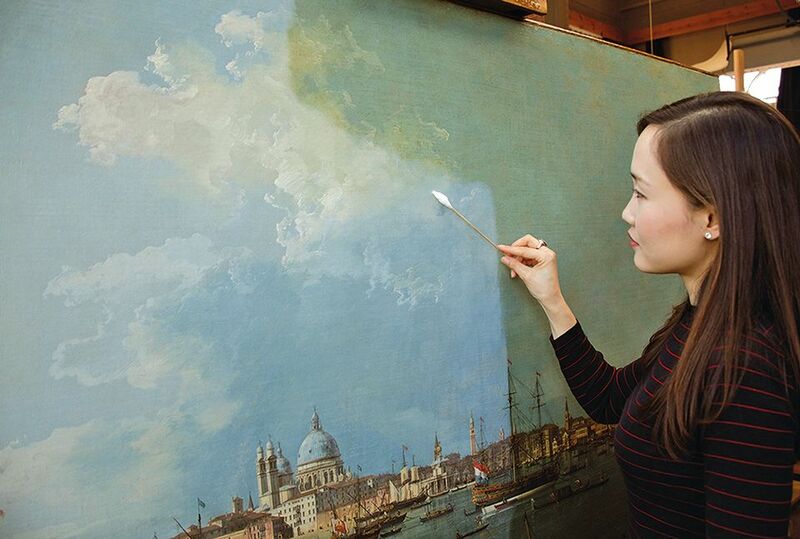 A crowdfunding campaign launched today (27 November) through Art Happens, the online platform of the UK charity Art Fund, seeks to raise £17,500 by 20 December to conserve Canaletto’s two pendant views of the Doge’s Palace (around 1740-45).